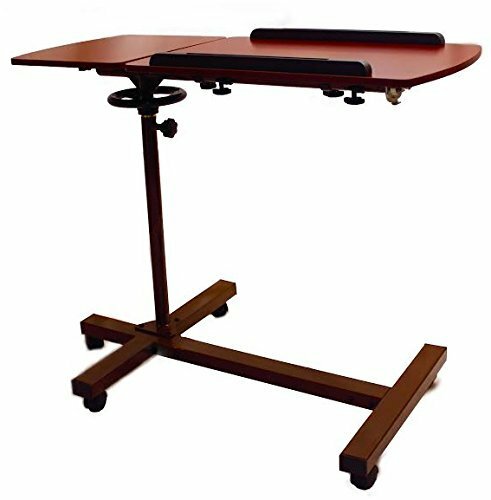 Overbed tables, or medical bedside tables, are bedroom safety aids that help facilitate the relationship between patients and their caregivers (Source). They are designed to accommodate home & hospital beds, or chairs of various sizes and become particularly indispensable for those individuals who spend a lot of time in prone positions (Source). These tables function sort of like comfort stations, allowing for easy computer use, dining, reading and a convenient space for caregiver collaboration. AmFab has been in business since 1971, providing American-made (Michigan based) healthcare and bed products. Their mission is to provide well-designed means of optimizing the daily interactions between patients, families and their caregivers. These versatile medical-assistance devices can truly enhance the quality of life of a loved, and even help caregivers provide care to their patients. Let's take a look at some of the best options! 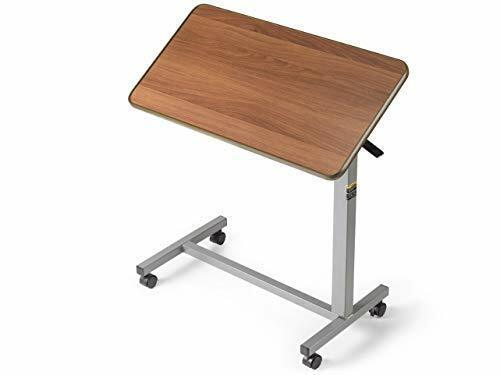 The Drive Medical overbed table is very stable, safe and user-friendly for people of all ages and needs. It has a large 15″ deep x 30″ wide top surface, which can be raised or lowered in positions between 28″- 45“. Additionally, the top surface is textured which makes it difficult for items placed on it to slide off. It comes in 2 color variants: Chrome and Silver Vein. According to one buyer we interviewed, it is a very sturdy table with great height adjustment, allowing it to slide under the bed or even a sofa. This overbed table by Drive Medical is one of the best-selling overbeds table currently available today. 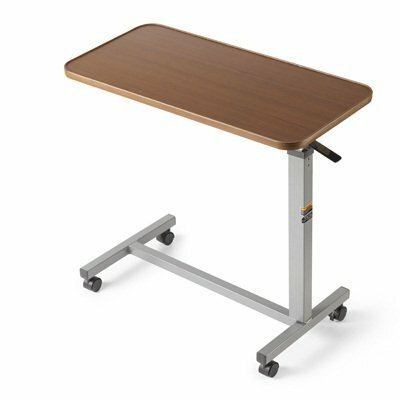 Built for stability, durability and ease of use, this overbed table has an adjustable tilt, 360° of motion, simple up and down movement and a heavy secure base. This overbed table weighs 42 pounds, while other tables on the market usually weigh between 12 to 14 pounds, which makes it highly durable, if somewhat heavy. The manufacturer offers a life time guarantee, and replaces any components of the table with exception to the finish, which can be chipped and scraped over a lifetime of wear and tear. Out of all customers we interviewed, a strong majority indicated that this was a top-quality medical-assistance device, while a smaller amount provided more temperate feedback. This product is ideal if you’re looking for a table to place your laptop on while sitting in a sofa or lying in bed. Made out of durable and lightweight plastic, this white colored overbed table makes eating, writing and doing projects while in a chair or bed a lot easier. The top table is 16” deep and 33” wide, which can be adjusted for both right handed and left handed use. This table’s base is made out of sturdy polypropylene and has 4 swivel casters that make little to no noise – this overbed table is a perfect choice for people with disabilities and particularity for hospital use. The Invacare Tilt-Top table has a simple design and features an adaptable top surface which can be adjusted to 3 angle positions. Its base is made out of durable, sturdy chrome-plated steel, which can support up to 25 pounds of evenly distributed weight. 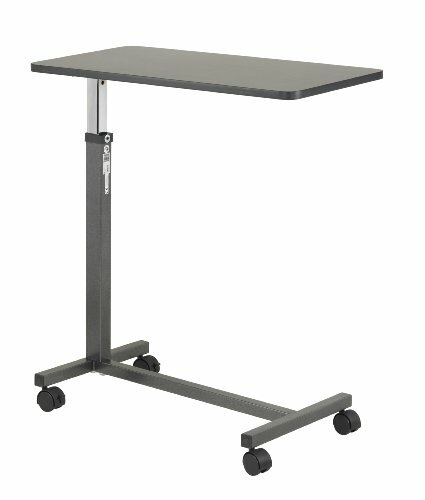 Most of the customers liked the option to tilt the top surface both ways, but there were also some complaints about table’s stability and overall durability. If you’re low on budget and looking for a temporary solution, this Invacare overbed table might be a solution for you. Eva’s medical overbed table is solid value. 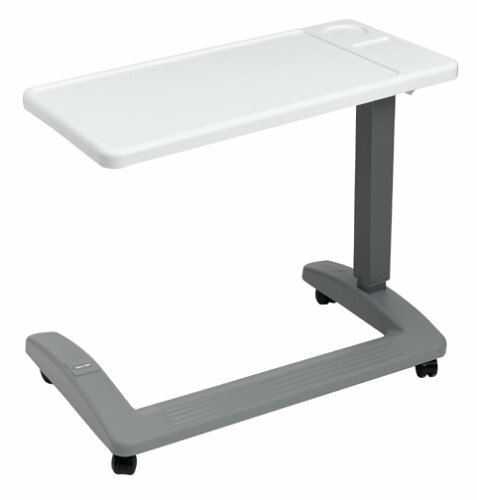 It is one of the top-selling overbed tables for hospitals and medical clinics and. This table’s top surface is made from walnut wood-grained laminate and can be raised or lowered between 28″- 45″. According to one of the customer reviews, this table can be used for a surprising variety of things. It is very sturdy and can hold up to 25 pounds of weight, making it ideal for having breakfast, writing or working on a laptop in the comfort of your bed. Although this might look like a medical overbed table, it is a fine option for residential use. Solid and sturdy C-shaped or U-shaped bases, that ensure superior stability. Typically there is about 24 inches of space between the legs, enabling it to conveniently slide under chairs as well as your bed. Typically these beds also feature locking casters- this means that the table will stay in place once it is securely positioned. An easily cleanable top, with a spacious surface area that tilts, though not steeply enough to cause items to slide off. Many models also offer a lip along the bottom of the surface area top that enables users to hold newspapers or books in place when it is tilted. Some assembly is usually required after you purchase and overbed table. Adjustable for right or left handed users. A fashionable appearance that easily blends with bedroom decour. Storage compartments to provide convenient storage space. An overbed table can be incredibly useful for an individual that is incapacitated by a medical condition , or even somebody who just spends a lot of time in bed and needs the extra convenience of an accessible surface area where they can access their laptop, place their newspaper, and easily have meals. It’s definitely important that you take some initial measurements before purchasing your overbed table . Most likely all of the overbed tables that we have reviewed above will accommodate the size and height of your bed and mattress, but is better to be safe than sorry. 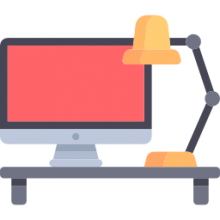 Take time to consider the features and functionalities that you require, as they typically vary between users . Some people really like to have a tilt top table, which is really useful if you would like to be able to angle the surface, say if you were reading the New York Times. Some people prefer just to have a flat top table with no tilting functionality as a space to play cards or to eat meals, and that’s it. It really just depends on what you are comfortable with and the sort of uses you anticipate employing with your overbed table . There are a variety of finishes, textures and colors available for over beds . Some of them look more suited for hospital use, while others will easily blend into your home decor because of their attractive, faux wood-grain surface. It’s really up to you what style you prefer, but many users prefer not to be reminded of medical environments when choosing a table that will be used in their own home. 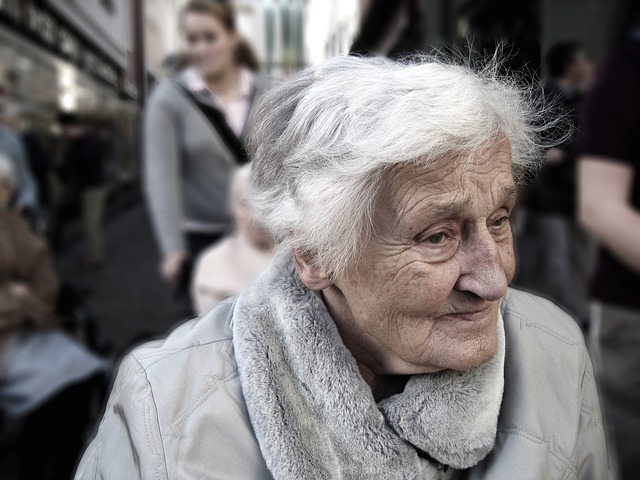 If you are providing care for a senior, it’s important that you step back and observe the situation to understand how you can be most effective. If you undertake too much on behalf of the elderly person in your life, you could experience emotional and physical burnout. If that occurs, you will not be able to help the senior citizen in your life or yourself either. As a caregiver, you will likely be required to take on different roles depending on the mental and physical abilities of the older adult. The activities of daily living (ADLs) needs to be assessed to discover what exactly they need help with on a daily basis. This will enable you to come to a decision concerning whether they’re living situation is safe and how much daily help is required. While you might have a natural tendency to do as much as humanly possible for your elderly loved one, you still must live your own life. You need to be realistic and understand what you are able to undertake without suffering the aforementioned burnout. For example, if it takes you an hour to drive to your elderly mother’s house, it certainly isn’t practical to expect that you will be able to prepare home-cooked meals for them every single night. A good way of doing this is listing out all the things that you do for your elderly loved one and then mark off the areas where you are going to require assistance. If cleaning is a big chore, it might make sense to hire a cleaning person- it will likely save you a ton of time to outsource some of this work even if it requires a bit of money to do so. Adult day programs are another great option to keep the elderly occupied and provide them some social time in their old age. Take an inventory of people you can potentially ask for help from- you may know some people who live nearby your elderly relatives who are able to check in on them or help you in some other way. In order to manage the caregiving relationship, it’s important to conduct a strategic assessment of what you are able to provide as well as what the senior requires. Effectively managing this relationship ensures that you do not get burned out and assuring the senior in your life will have the best care available to them.